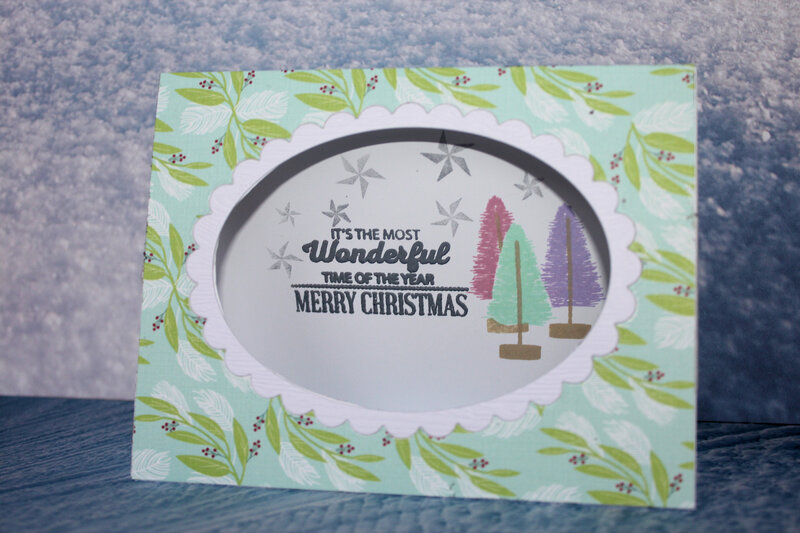 The 25 Days of Christmas Tags is a challenge put on by Tracey McNeely. I thought I hadn’t participated in this one before, but then realized that I had a number of tags photographed in a file. I would only do this for challenges. The nice part of this is that most of them were used to decorate real Christmas presents rather than to pile up in a shoebox. Yay! I do like making my own gift tags, and I have gotten some new tag making stamps and dies lately, so this blog challenge seemed like a good thing in which to participate, again. Loads of sponsors and loads of prizes added to the attraction. The idea is to seek inspiration from the tags presented by the design teams and create your own tag from this. I only noticed this challenge today and it is already Day 5, so I have some catching up to do. As I said, I have some new tag making stamps and dies, but for Day 1 I was inspired by the tag by Lindsay M-p which featured a cardboard box. I have had the box die that I used from Neat and Tangled for a few years now, but it is one that gets pulled out again and again. I had a different dog in mind for the box, but I decided to use this one from Simon Says Stamp instead, as they are the sponsor for Day 1. Knit Picky from Lawn Fawn supplied the patterned paper and the Merry Christmas is from Tonic Studios. Now somebody is really trying to tell me something. The Make it Monday challenge has featured the use of a wreath for the last three weeks in a row. I have mentioned two things regarding this. The first is that I do not have any type of wreath stamp or die from Papertrey Ink and the second is that I like a challenge. But three weeks in a row, people…………………now that is a challenge. Looking through my dies once again, while whispering the mantra, “what can I adapt?”, I came across the heart frame from Shakers and Sprinkles. Check, I will use that and somehow make it look Christmasy. I also didnt have any ribbon from Papertrey but found some holly ribbon from May Arts, that I thought would start to transform the wreath into a Christmas theme. A little bouquet of greenery from Spruce and Sprigs was an easy choice. Finally I found a little sentiment in Post & Parcel that would tie in Christmas with the heart shaped wreath. 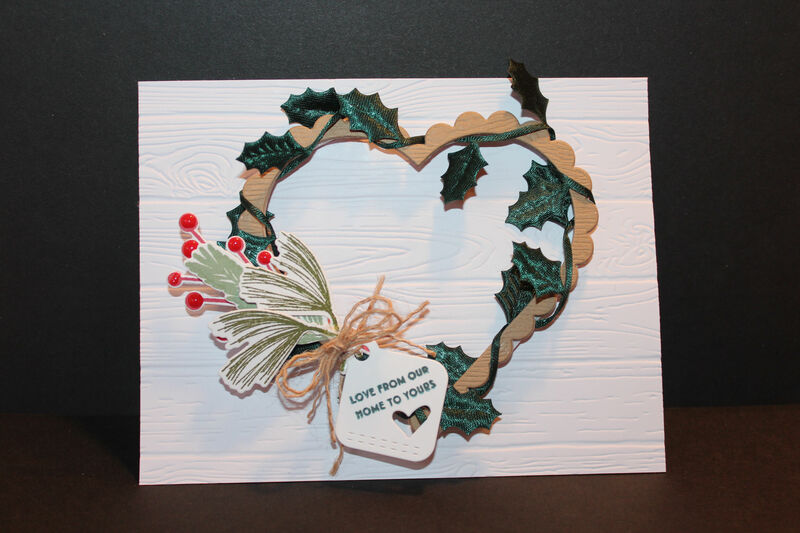 The background is a 3D woodgrain embossing folder from Stampin Up that is just remarkable in its depth and detail. Voila! Done! This will be my last card for the Fall 2017 Bloghop. I am away today at the Great Canadian Scrapbook Carnival located at the amazing Spruce Meadows Show Jumping facility. When you first walk in, there is definitely an aroma of horses, but I prefer to think of it as a giant “scratch ‘n’ sniff” sticker, and the disconnect between the equestrian facility the scrapbook carnival is soon forgotten. I am careful not to drop any brown embellishments on the floor though (Just kidding it is as clean as a whistle in the building)! Anyway back to the card for today. 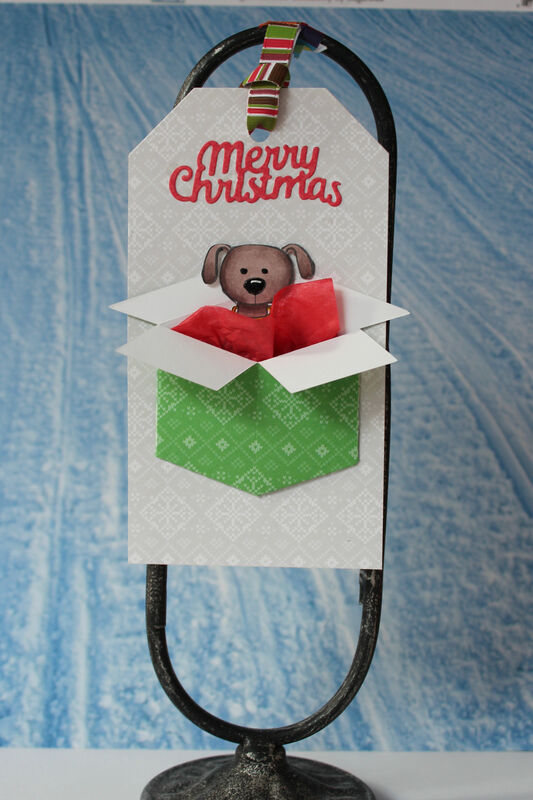 The card I ended up with today bears no resemblance to the one I was going to make. Changed the paper, changed the dies, changed the colour scheme and even eliminated the stamp I was going to use. It may not be gone forever, but it needs to “marinate” for awhile, I guess. In the meantime, the card below evolved and it turned out quite well. I will leave it to you, dear readers, to decide whether the “Love Ya” refers to each other or to a narcissistic love of pumpkin spice coffee. Some days are just better than others, aren’t they? So far, this day has been a great one. First of all, I found out that I won a stamp set from The Ton stamps during their latest release giveaway. Double, Double, Quadruple Yahoo about that! Secondly, I finished preparing for a Scrapbook retreat that I am going to this weekend. Usually going to a retreat entails packing in haste, and then lamenting that the perfect item for what I am working on, is in my stash at home. “Not this time”………….she says proudly. This time I have made up about 10 homemade kits in preparation. Everything I need for each double page layout is tucked into a 12X12 zip lock bag. Some assembly required, of course, and some blank spaces to be filled with items from the shopping frenzy that is part of the Great Canadian Scrapbook Carnival, but generally they are “Good to Go” and I won’t be stymied from completing quite a few pages. The last good thing that has happened so far (hopefully more to come :-)), is that I got another coffee card made for the bloghop. It is a set that I didn’t have for the last bloghop, so it is always fun to see what can be done with it. Today’s card piggybacks on the home decor trend of using pallets for wall decoration. They usually include some “bon mots” on them and so I did the same on my pallet card. Home decor pallets also have a lot of dimension to them and I created the same on my card by using wooden pieces and felt leaves. I think it turned out well. Where does the time go? For that matter, where did I go? It has been two weeks without a new post. It seems September is crazy busy, even for me without any school kids. It is also Scrapbook Retreat time and I have been away at a few of them. I have been creating layouts of the British Isles cruise that I was on this summer, and as a result did not have a new fall themed coffee card, in hand, and ready to go. I did get a new coffee cup die since the last Coffee Lover Bloghop, so that was the easy choice for this first card. I liked the size of this coffee die from Sugar Pea Designs and I especially liked the embossed lid lip so I had to have it. I think the card turned out well. In an effort to adhere to the fall theme, I made my coffee Pumpkin Spice flavour, but truth be told, I personally don’t like pumpkin flavoured anything. Lizzie’s challenge is to use wood in an inlay technique. Wood is the material for a 5th anniversary. This project turned out very nice. It is a good thing as it came on the heels of an Epic Fail on Nicole’s rusty iron technique. I am still licking my wounds from that one, but I may blog about it, if I can quit pouting over it. Jessica’s challenge is to use the 8th anniversary material of bronze in a project. I did not have a bronze embossing powder so I made my own. I wanted a thick rough looking embossing powder like the Hammered Gold that I have from Emerald Creek Trading Company, so I mixed some of that with some very old and very chunky looking silver and gold from Frantage. I loved the resulting mix and I really love that I used up every bit of the mix so there was nothing left to store for that never project in the future. I used a stencil brush to add heavy brush marks of embossing ink to the feathers and background. A light touch would not work here as the heavy powder would blow away, the instant I put the heat gun to the paper. The Papertrey Ink Scroll Frame added to the Vintagy look of the embossed What the Doodle Feathers. The bow is from Maggie Holmes.